It's been a while since I've participated in my ATC Live Trade Group. I did get to see a few of my ATC sisters a couple weeks ago at Shelly's place. I was also pleasantly surprised to meet in person one of my yahoo group sisters from the enjoyMichaelStrong group - Laura! I also meet a new stampin sister Lynette, Laura's sister. What a fabulous afternoon of coloring and chatting - creative juices everywhere! The next day, I saw a couple more of my ATC sisters at the Creative Cards and Cuts. It was their grand opening week and they had some great deals. Our theme this month is journaling. There's so many possibilities! For the background I used Dylusions ink sprays - love the vibrant colors. I was inspired by to get out my spray inks by some lovely pieces my ATC sister Cindy shared at our get together. I spritzed a sheet of Cryogen with water, then spritzed color with ink sprays. I laid a second piece of cardstock over the sprayed piece and pressed it light with my fingers. When I pulled it apart I had a mirror image of vivid colors. Next, I cut up the cardstock into ATC size pieces, laid a stencil (The Crafters Workshop) over them and sprayed with white ink. I flipped the stencil over onto more ATCs. I chose a variety of stamps to add different images to each ATC. I combined drawing and coloring tools - markers, paints, pens, color pencils - to create a journaling buffet. I wrote a special phrase or word on each one. Sharing ATC designs I did over at my Stampin' Headquarters. Please click on the photo to see the details of how I made them. Wow! I did not realize how busy I've been at my Heaquarters! I'm sharing some designs I created over there. Please click on the photo to see the details of how I made it. Had a great time with my ATC sisters, as usual! Sharing the lovely Artist Trading Cards I received. OOps. I noticed I posted my June ATCs as July. I'm moving quickly through the summer in mind. :o) Now that I have corrected the month, I'm sharing the ATCs I received at our ATC Live Trade on Saturday. I really enjoy my time with this group of lovely, talented woman! This month our theme is weaving - something I have never done. :o) So..... as I thought about my project and looked at my supplies, I decided to use yarn. As I learned, not a good weaving material - too many fibers. ::o) I had fun. I just hope they stay together long enough for me to trade. Used my new favorite medium of wax to create bright backgrounds, ironing on 8 1/2 x 11 pieces of card stock. Cut them into slightly smaller ATC sizes and adhered them to black background layers. After I viewed a couple Youtube videos, I was ready to weave. I laid out several pieces of yarn horizontally on my desk and then taped them at both ends. I then cut several layers of yarn and started weaving it through. Oops, that cute strawberry paper is in the photo accidentally. It's from Papertrey Ink and will be used on a project I'll be posting in a few days featuring a new Hambo Stamps digi image. I used my Xyron to create a double sided adhesive piece of card stock. I peeled back one side and laid a sticky side onto my long weaved piece. I trimmed the extra card stock away. I cut up the weaved yarn into small pieces and set aside. Inked up basket of yard image and stamped onto card stock. Repeated for several images. Used 2 or 3 markers from the same color family to add color to the image. Cut out each image and ran through Xyron. Assembled each ATC. Used glitter pen to add a little bling. Spritz watercolor paper with water. Use paint brush to spread Shimmerz paints around in random fashion. Dip the brush in water to help spread color smoothly. Use a variety of colors to fill sheet of paper. While paper is still wet, spritz with Tim Holtz recipe for Perfect Pearl mist recipe. I used gold Perfect Pearls and yellow ink mixture. Dab randomly with a paper towel. Allow paper to dry. TIP: If your paper is curled when it dries, set heavy books on top over night to flatten. Cut into ATC size - 2 1/2 x 3 1/2 inches. In up images with black ink and stamp on individual ATCs. Ink up images with gold ink and stamp on individual ATCs, sprinkle with embossing powder and heat set. Here are the fabulous ATCs I traded for this past weekend! We have such a talented group! I was so excited to see my friend Susan who I hung out with in November when I visited my daughter in California. See here and here to see how much fun we had. Tear strips of Eclipse tape of different widths and lay down on full sheet of cardstock. Use direct to paper technique to lay down color - slide your ink pad across the paper. I used a variety of ink pads and got various results. I suggest you use what you have to find what you like. After laying down the first color, move the strips and lay down the second color. Repeat until you get the results you want. I created four different backgrounds with variations of ink pads. For one of the sheets, I added glitter, using the Pearl's Mist Tim Holtz recipe. Cut card stock to ATC size pieces. I like a boarder around my designs, so I trim a slightly smaller. Lay cut out images over ATCs to find the combinations you like. Stamp a black image as part of the background. Adhere cutout images on top. Adhere background layer to an ATC size (2.5" x 3.5") base card. Use glitter and glitter pens to add a little bling and highlights. Rub watercolor paper with anti-static bag. Ink up vase image with gold ink. Stamp vase onto watercolor paper. Sprinkle embossing power and heat set. Add color to the vase sections with markers by adding small dots of color in a corner of the area and then spread the color with the water brush. Ink up the distress image with gold ink. Stamp onto background on an angel in one corner. Sprinkle embossing power and heat set. Cut a tiny strip off the bottom and one side of the ATC. Adhere to a black layer that is cut ATC size (2.5" x 3.5"). Adhere vase image in corner. Be sure to sign the back of your little art piece! Today is ATC Trade Day! Run water over watercolor paper, shake off excess and then lay on paper towels to dry. If the paper is curled after it dries, place heavy books on it overnight to flatten. In an aluminum pan, spritz water onto watercolor paper. Squeeze a few drops of color. The color will spread in the water. Tilt paper around to allow color to spread over paper. Once you see how the color spreads, you can decide if you want to spritz more water. NOTE: You can also start with dry paper and then spritz. Add second color. Tilt paper around to allow colors to mix and spread over paper. Repeat for third color. For the red background, I started with yellow, then orange and then red. For the blue background, I started with blue, then violet, then yellow. Be careful not to over mix or you will have all one color. If you miss an area, use your finger or a paint brush to move color to that area. You can also leave areas untouched. The fun in this technique is that it is different every time it looks really cool! Allow to completely dry. If the paper is curled after it dries, place heavy books on it overnight to flatten. Cut to ATC size - 2.5" x 3.5". Use quill pen and black ink to draw images. Allow to dry. Use white pen to add highlights. Yesterday was our June meeting for my ATC Live Trade group. We spent time trading, sharing ideas, and making a folded ATC. This month's theme was wedding/romance. 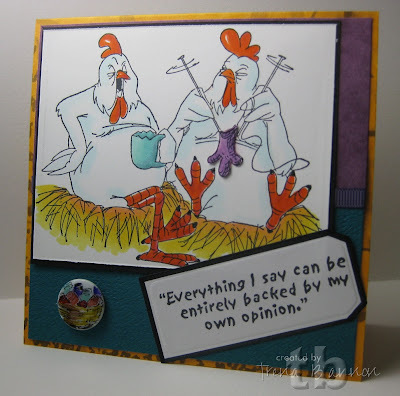 We make one special ATC with the theme to put in our grab bag. The rest of the cards can be along the line of the theme or what ever your creative heart desires. Someone also shares technique or demos an idea. This month we did folded ATCs. Here is my grab bag ATC for this month. What a great group of talented and nice artists!! Hello Everyone!!! I have missed posting. I hope everyone is having a lovely year so far - I am!!! I'm sharing my ATCs I made and also the wonderful ATCs I've received at the last few meetings. I realized I had not been sharing - oh! We moved our meeting place to The Atlanta Bread Company in Winfield, IL. If you live in the area and would like to join us, we'd love to have you!! We meet on the first Saturday of the month at 3:30. We eat, we laugh, we share, we laugh, we hug, and sometimes we create in real time. This month, I did a Copic demo and we colored - one of my favorite things to do!! Next month, we're going to learn about felting. The group members do a variety of arts & crafts and someone always brings great projects and tips to share. Supplies: All the images are from Close to My Heart. I colored the images using Copics markers. On the penguin cards I sponged the snow lines in and created the smooth skies using the airbrush system. I invested in a mini air compressor. I absolutely dig it!! Where you see the snowflake embellishment - that's where I made a "le boo boo." :o) I edged the cards with a silver or gold Krylon pen. Sharing the ATC's I made for the September trade.